Kitty Adventures: I don't wear makeup. Thats right. I have not worn a stitch of makeup for the last year or so. And before that I hardly wore it at all, perhaps only on a weekend or a special date. That means I didn't wear makeup to my wedding. Now, why, you may ask, do I not want to liberally apply chemicals to my skin on a daily basis? 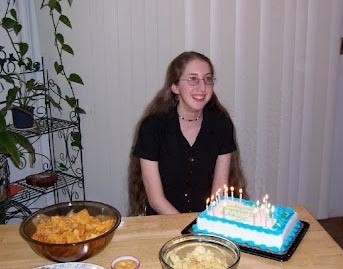 My 17th birthday. I miss my mane. So I asked my mom if I could wear it. She said no. And I was bummed. But it was high school, and I was used to my mom saying no to things, so it wasn't that big of a deal. But when I started college she bought me some and I attempted to use it. I don't like makeup. For starters, I'm allergic to everything. Mary Kay? Makes me look like I've been attacked by honey bees, or cursed by the wart king, or something. I found some brands I can use (why does the Walmart brand not break me out??) but then...makeup take so long to put on! I don't like how long it takes. It's annoying to spend 20 minutes in the bathroom. And don't get me even started on how hard it is to draw eye wings. Or put on eyeliner. Sure it looks good, but lets be honest, no one has time for that. So after college I just basically stopped using it. And I realized yesterday that I haven't even unpacked my makeup box from when I moved in with B. I mean, I pulled my nail polish out to bedazzle my toes, but left everything else. Maybe one day I'll use it, when I need it. If I need it. Right now I like myself the way I am. Is that weird, or something? Why do you use makeup?